This Martyr contested in 141 in Trajanopolis of Thrace, during the reign of the Emperor Antoninus Pius. 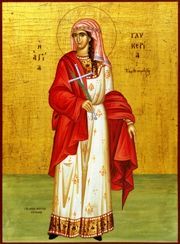 At a heathen festival, when Sabine the Governor of Trajanopolis was offering sacrifice, Saint Glyceria entered the temple and declared herself to be a handmaid of Christ. Sabine commanded her to sacrifice. She went to the statue of Zeus and overturned it, dashing it to pieces. She was subjected to many horrible tortures, and finally was cast to wild beasts; bitten once by one of them, she gave up her soul into the hands of God. Loving Mary ardently, the Theotokos and Virgin, thou didst keep thy maidenhood all uncorrupted and spotless; smitten in thy heart with longing for thy divine Lord, thou didst strive even to death with courageous valour. O Glyceria, for this cause, Christ God doth crown thee with an august twofold crown. Share the feast of The Holy Martyr Glyceria with an icon greeting ecard.